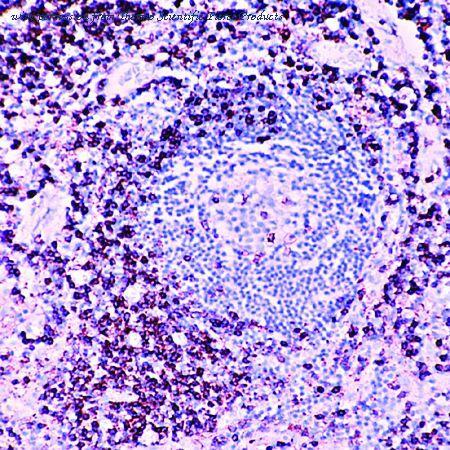 Formalin-fixed, paraffin-embedded human lymph node stained with CD45RO antibody using peroxidase-conjugate and DAB chromogen. Note cell membrane staining of T lymphocytes. Figure A. FITC conjugated Mouse anti Rat CD43 ( MCA54F ) and RPE conjugated Mouse IgG1 isotype control ( MCA1209A647 ). Figure B. FITC conjugated Mouse anti Rat CD43 ( MCA54F ) and RPE conjugated Mouse anti Rat CD45Ra ( MCA340PE ). All experiments performed on red cell lysed rat blood gated on lymphoid cells in the presence of 10% rat serum. Data acquired on the ZE5 Cell Analyzer. Figure A. RPE conjugated Mouse anti Rat MHC-II ( MCA2687PE ) and FITC conjugated Mouse IgG1 isotype control ( MCA1209F ). 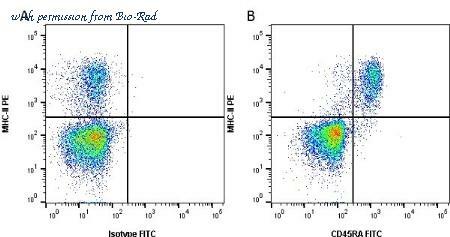 Figure B. RPE conjugated Mouse anti Rat MHC-II ( MCA2687PE ) and FITC conjugated Mouse anti Rat CD45RA (MCA340FT). All experiments performed on red cell lysed rat blood gated on lymphoid cells in the presence of 10% rat serum. Data acquired on the ZE5 Cell Analyzer. 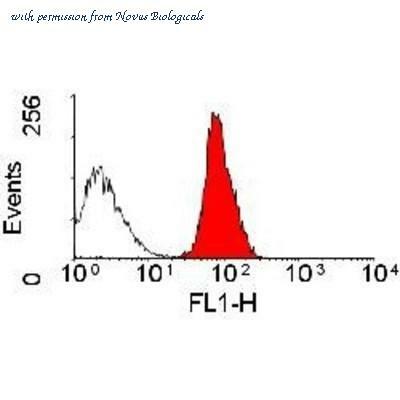 Western blot analysis of extracts from spleen cell and Raji cell using CD45 antibody. 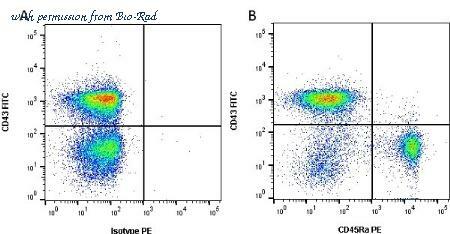 Flow cytometric analysis of Raji cell using CD45 antibody. Immunohistochemical staining of Human gastric adenocarcinoma tissue using CD45 antibody. 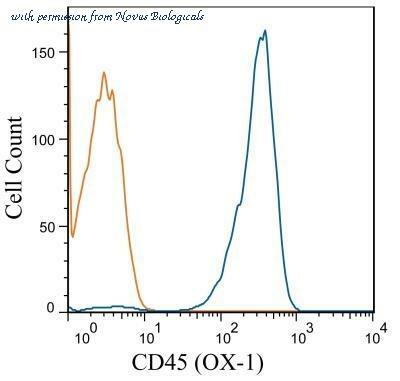 Flow Cytometry: CD45 Antibody (OX-1) [NB100-64895] - Analysis using Alexa Fluor (R) 488 conjugate of CD45 OX-1 clone. Rat Splenocytes were stained with CD45 (OX-1) antibody 100-64895 (blue) and a matched isotype control NBP2-27287 (orange). Cells were incubated in an antibody dilution of 1 ug/mL for 20 minutes at room temperature. 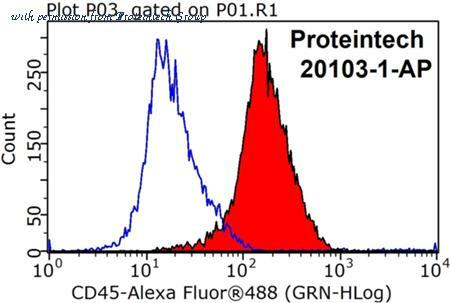 Both antibodies were conjugated to Alexa Fluor 488. 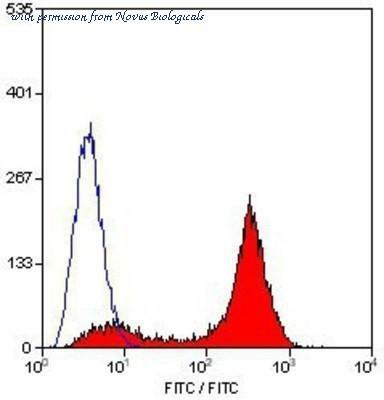 Flow Cytometry: CD45 Antibody (OX-1) [NB100-64895] - Analysis using the FITC conjugate of CD45 OX-1 clone. Staining of rat spleen cells. Flow Cytometry: CD45 Antibody (OX-1) [NB100-64895] - Staining of rat peripheral blood lymphocytes with mouse anti-rat CD45 OX-1 clone. Western Blot: CD45 Antibody [NBP2-15811] - Raji whole cell and membrane extracts (30 ug) were separated by 5% SDS-PAGE, and the membrane was blotted with CD45 antibody diluted at 1:1000. 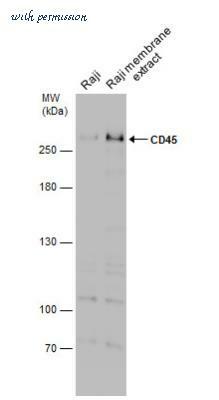 The CD45 antibody from Proteintech is a rabbit polyclonal antibody to a fusion protein of human CD45. This antibody recognizes human, mouse antigen. 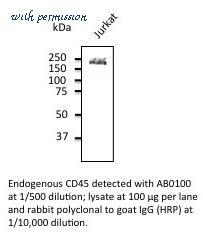 The CD45 antibody has been validated for the following applications: ELISA, WB, FC, IP, IHC analysis.